Railway Recruitment Board Released a Recruitment Notification. Railway Recruitment Board(RRB) has finally released the official notification for the recruitment of Assistant Loco Pilot (ALP) & Technicians Recruitment. 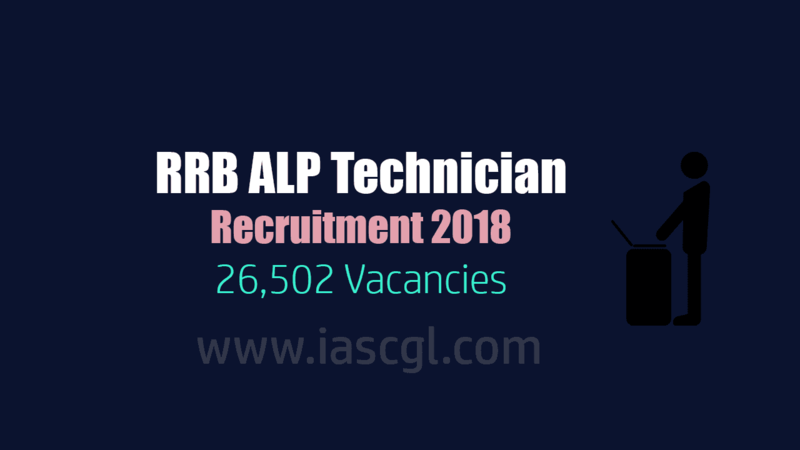 RRB will be recruiting to fill 26,502 vacancies for ALP and Technicians. Interested and eligible candidate can apply for the same from February 03, 2018(10:00am). Candidate can visit official website of RRB to fill online application or direct link of online application is given in this article. Last Date of Online Application 5 March 2018 upto 2359 Hrs. Level 02 of 7th CPC Pay Matrix with initial pay of ₹19900/- plus other allowances as admissible. You should have Matriculation / SSLC Plus ITI/ Course Completed Act Apprentices or Diploma/ Degree in Engineering. Refer to the detailed CEN published on the websites of RRBs for Trade/Disciplines. Matriculation/ SSLC Plus ITI / Course Completed Act Apprentices or 10 + 2 with Physics and Maths or Diploma in Engineering (As Applicable). Refer to the detailed CEN Published on the websites of RRB’s for Trades/Disciplines against each of the posts.